"Steel Line" entrance doors pass through all stages of the production process, from steel processing, steel-work welding, painting, decorative panels production to their assembly into an end product. 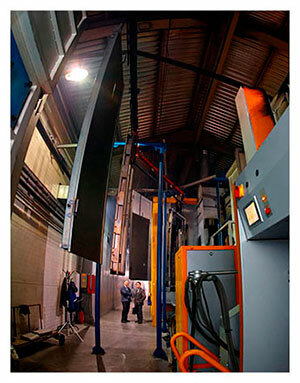 The entrance doors production uses bending and profiling technology, which is known to be the most advanced. Complex trough-shaped profile is bent from steel sheet, it combines the functions of the frame and the exterior paneling of the door leaf. Bent steel profiles are welded to the trough-shaped profile, thus creating a rigid frame. to move the lock farther from the outer surface, making break-in more difficult. 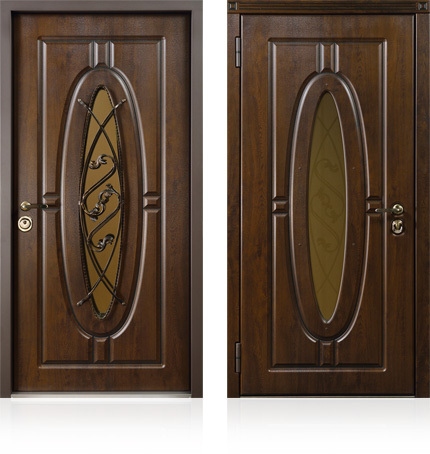 to create a door of greater thickness with a minimal increase in its weight, which extends the service life. to set up to 3 door seal contours around the perimeter, which improves heat- and noise insulation. The front door installed at the "street-house" border requires a special approach in its production. Besides high noise insulation properties, it must provide a high level of leak tightness & heat insulation and have weatherproof trimming and fittings. Door framework is reinforced with specially developed system of vertical and horizontal ribbed stiffeners, which is highly resistant to load and increases solidity. The outer part of the lock is protected by a metal plate, which increases break-in resistance of the front door (the total thickness of steel in the locks area is up to 3 mm (0.12")). Door frame is created from a bent profile, which provides high rigidity and allows you to "recess" the door leaf in the frame. The hinges used are designed and manufactured in Italy. They are engineered for the weight that's significantly greater than the weight of the front door. 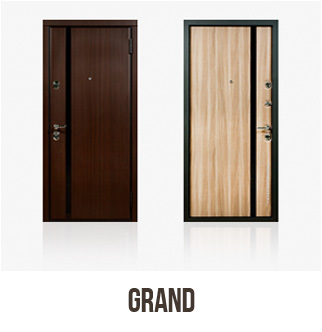 The heavy doors are equipped with two reinforced hinges with self-centering element. The ledge controller allows you to adjust the door leaf abutment during the entire service life. This ensures smooth operation of locks and comfortable closing of the door. Durable and reliable operation of metal doors is provided by high quality of the steel and precision during manufacturing of all construction elements - precision of cutting, punching and bending is up to 0.1 mm (0.0039"). Technology of the phosphate coating of the surface is applied to protect the door from corrosion. The main point of the process is to create the special protective layer on the steel surface. Anti-vandal polymer coating is resistant to scratches, it doesn't require special care and protects the door from corrosion. Entrance doors with a metal outer surface are suitable for apartments and business premises, as they provide a sufficient level of noise- and heat insulation. 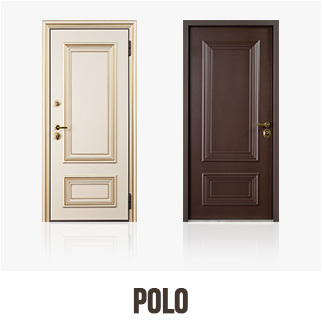 Entrance doors with HDF-coating have lacquered surface resistant to slight scratches and chemicals. The HDF-panels are easy to maintain. These models are an excellent option for the apartment door. 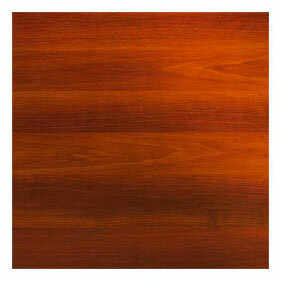 PVC coating simulates the texture of wood, it is resistant to scratches and offers a wide range of colors. MDF panels are resistant to temperature differences, they are much denser than wood. 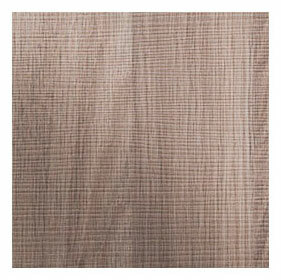 "Eco veneer" is high-quality artificial coating, reproducing texture and pattern of wood in great detail. 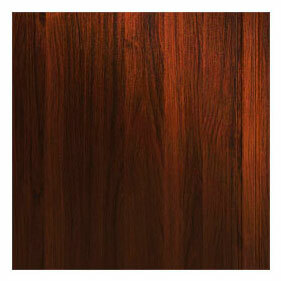 "Eco veneer" coating is durable and resistant to slight scratches and chips. 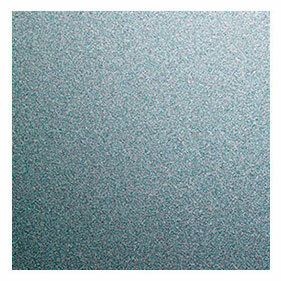 Anti-vandal SteelTex coating protects the door from UV rays, and is resistant to high humidity. Resistance to aggressive environmental factors allows applying this coating for the doors at the "street-house" border. The factory uses a high-strength Italian lacquers and paints, while the quality of moisture-resistant MDF panels is guaranteed by German manufacturers. High levels of weather resistance allow the use of SteelLak coated panels for the doors at the "street-house" border. 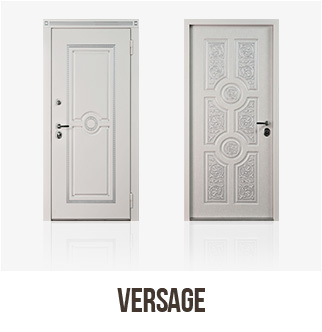 Years of experience of "Steel Line" company has shown that door models with metal/door panel or metal/metal trimming are not suitable for the installation as the entrance/exterior doors. Installation of such doors is allowed as the front door to the utility room and the door from outbuildings into residential spaces (entrance from the garage). Exterior door accessories production is fundamentally different from the process of production of interior door fittings. "Steel Line" company uses locks and locking systems of leading manufacturers in Turkey, Italy, Russia, Israel. Turkish company «Kale Kilit» is a global manufacturer of locks and hardware: cylinder mechanisms, armored lock cylinder protectors and latches. High quality and reliability of "Kale Kilit" products are worldwide appreciated, they conform to the quality standards of such countries as Germany, the Netherlands, Russia. 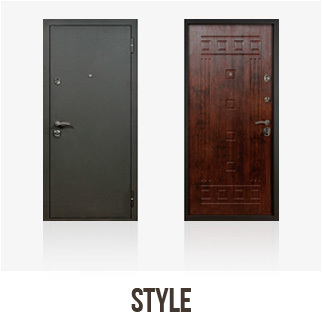 Due to the constructional features, the door hardware is well proven in the operation under extreme conditions: dust, low temperature, high humidity. The company manufactures locks since 1963 and covers the markets of USA, Europe, CIS countries. "Mottura" locks are reliable, they have a modern design and long lasting operating life. A distinctive feature of "Mottura" products is interactive floating element on "MyKey" key, which eliminates the possibility of duplication, as well as break-in with the master key. "Mul-T-Lock" is a company with forty years of experience in the locking systems development. It has more than five hundred international patents worldwide. Ultra strong multi-channel locks, on the basis of the rotary mechanism with transcoding/conversion, are constructed from high quality alloys. It provides durability, longevity, resistance to wear, corrosion & acids, as well as high resistance to unauthorized break-in. The Italian company is engaged in the production of locks and hardware since 1967. Constant checking of their own products allows creating a quality product, and keeping up with market trends. The company creates locking devices for safes & lock boxes as well as locks for steel and armored entrance doors. "Securemme" in-house production pays attention to detail and quality of the products - all manufacture stages are controlled by complex computer systems, thus providing continuous monitoring in order to avoid defects in the end products. 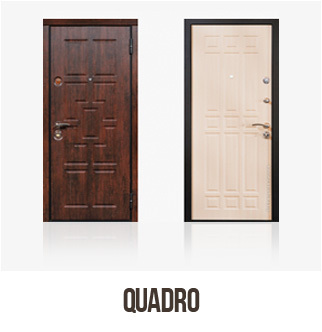 The company has 20 years of experience in the production and realization of locks and door hardware. Production of the "Apecs" factory is represented in thirteen countries. Their in-house laboratory allows controlling the quality at every stage of production. 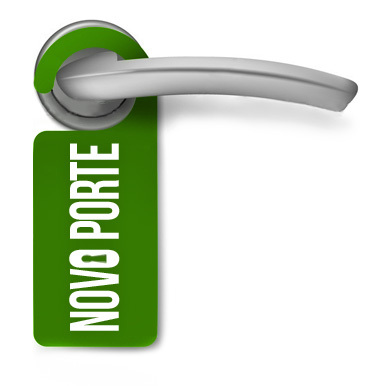 The company offers locks and door furniture of different price categories: from economic to premium. On special request of "Steel Line" company the locks are produced by the largest factory in Russia - "METTEM", which manufactures hardware and locks since 1992. Thermal- and moisture-resistant MDF is protected by a weather-resistant SteelTex coating, SteelLak coating or Oak Panel. Heat insulation cellular polystyrene does not absorb condensation and moisture from the air, does not lose the heat-protective properties and prevents the corrosion of steel. A layer of special insulating material "Porileks" isolates the reinforcement ribs, eliminating the "cold bridges". Thermo-material "Heat mirror" reflects up to 98% of radiant heat, creating a "thermos" effect. It improves heat insulation of the door for more than 30%. The door frame is insulated with two layers of "Porileks", which does not absorb condensation and moisture from the air, hereupon the frame does not corrode or rust. Long-lasting two-component sealant of the Schlegel latest generation (Germany) is resistant to aggressive environments, temperature difference and retains its elasticity at low & high temperatures. The plates on lever tumbler lock with spring-loaded shutters do not miss the cold air through the keyhole. Additional sealing of door leaf and frame joints eliminates the cold air or moisture transmission in the hidden cavities of the door. The ledge controller allows adjusting the door leaf abutment during the entire service life. Constructors and designers of "Steel Line" company have developed a multi-level security system of entrance doors - high structural strength is combined with a reliable locking system. Installation of locks of different types significantly increases the break-in resistance. Lock and latch groups (deviators) provide additional locking points. Cut-in armored lock cylinder protectors made of hardened steel are mounted directly on the lock body and prevent it from break-in. High quality of the matching accessories is confirmed by hundreds of patents, and the reliability of the locks from world manufacturers is confirmed by certificates of conformity to the highest safety classes. The locking system includes locks and protective equipment that protect the door against unauthorized entry. The door leaf and frames are insulated with environmentally friendly mineral wool, while the entrance door from the outside part use multilayer insulation systems and sound proofing, specially designed for outdoor use. It allows achieving the level of 45 dB sound insulation and reducing the coefficient of thermal conductivity up to 0,85 W/mK. exclusive offers, insider sales and 10% off on your next purchase.